REFORMA Northeast Chapter established the Lillian Marrero Scholarship Award in 2010 to encourage library science students in our six states who are committed to serving the Latino community by providing financial assistance, as well as to help recruit and nurture more diverse and multilingual library staffs. 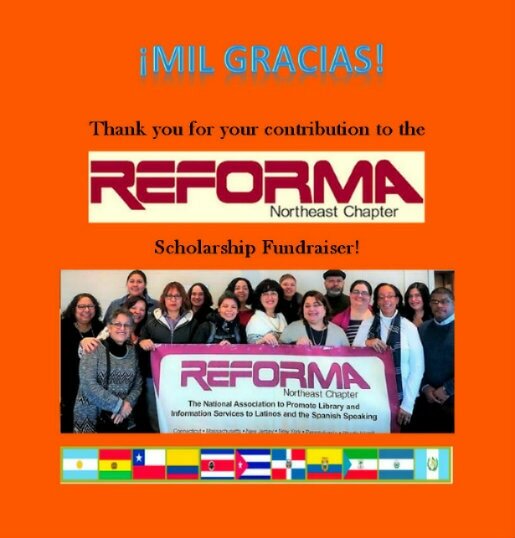 The scholarship is named in honor of the late Lillian Marrero, a librarian of the Free Library of Philadelphia, for her excellent service to underprivileged communities, as well as for her outstanding commitment to representing, recruiting for, and promoting the REFORMA Northeast Chapter and its missions. In order for us to continue offering this important award, which helps to fulfill our mission, it is vital that we raise more funds. (We currently have enough funds to cover one more scholarship) I urge you to consider making a contribution to the scholarship fund as we hold our First Annual Spring Fund Raising Campaign. The goal of the campaign is to raise $1,500 between March 20, 2017 and June 21, 2017. Please consider making a generous contribution to this worthy cause. Your contribution to the Lillian Marrero Scholarship Award is greatly appreciated. Manny Figueroa – Fundraising Committee Chair, REFORMA Northeast Chapter.